It seems like a lot of our projects take a long time to complete. 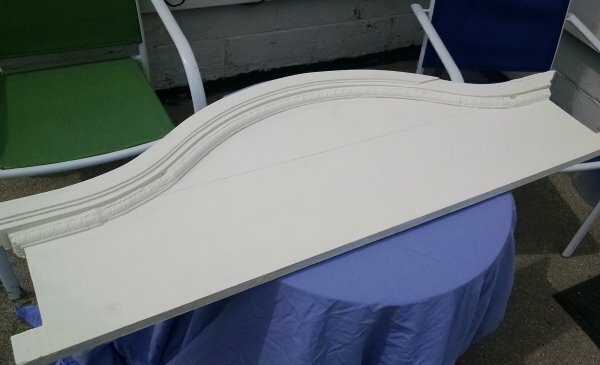 But this isn’t because they are particularly difficult – sometimes we are just unmotivated, sometimes it’s almost a hundred degrees out for weeks on end and it’s just too hot out in the garage/workshop. Sometimes, a piece just has to sit there unfinished until the right element comes along to finish it. 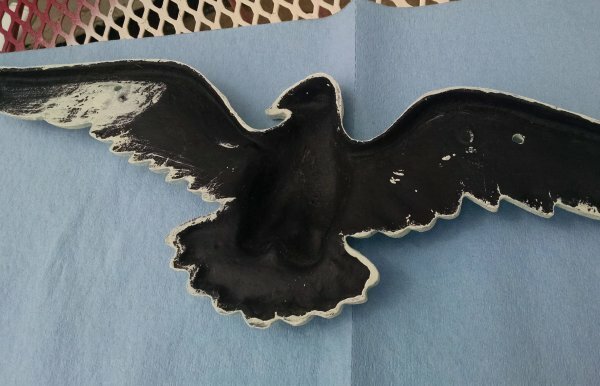 And sometimes you buy a thing and you don’t really know what it’s going to become, but it’s just too interesting and too full of vintage mojo to pass it up. 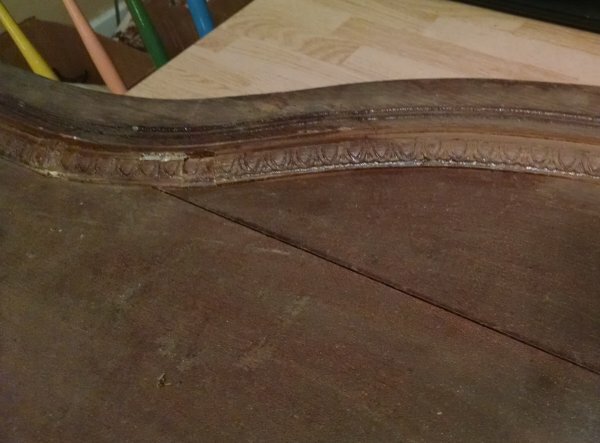 It’s about 40 inches wide, very heavy, has some damage, and like other pieces we’ve purchased came with free spider egg sacs. (Score!!) 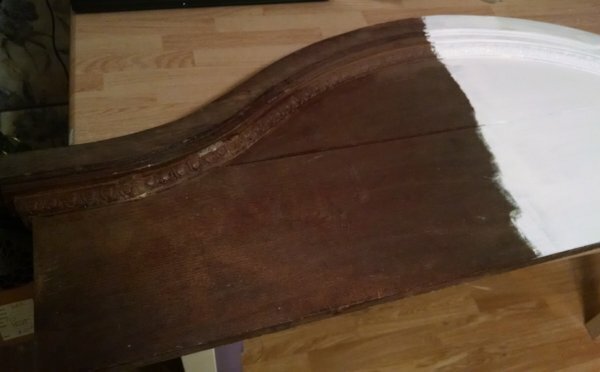 True to form, I forgot to take an actual “before” picture, but I did take one shortly after I started painting it. Fun side note: it took me several weeks to decide to paint it… and at the time I started, I had no idea what I was going to make out of it. But I knew it had to be painted. … hung onto them for several more weeks. 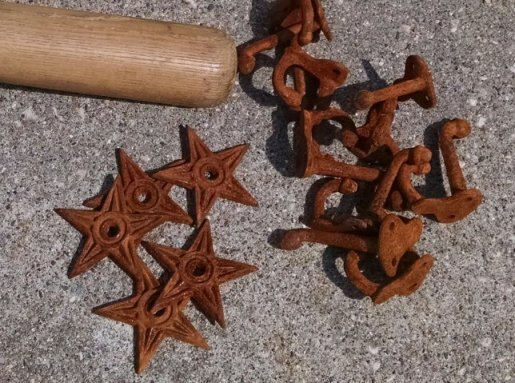 I knew hooks would look great across the lower portion of the piece, but that left a large empty space under the arched portion. Thought about finding a mirror to fit, or painting some roses on it, but just couldn’t decide. Then, a great piece came long at a flea market. 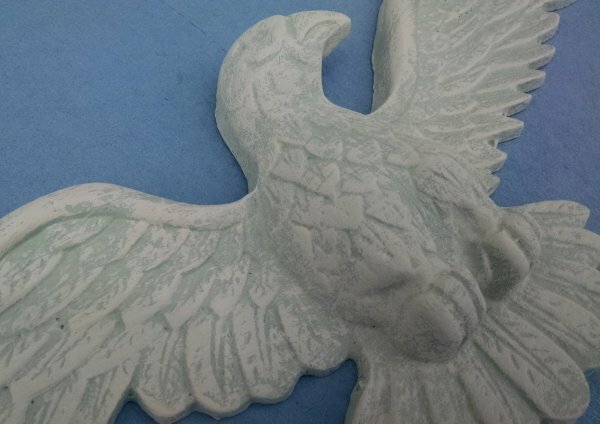 It’s a cast-iron eagle, again no actual “before” picture but the unpainted backside of it shows the original color. 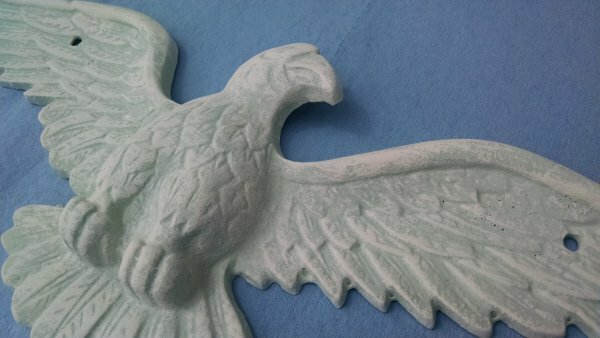 I painted the eagle with a custom-mixed mint-green chalk paint. Once the green was dry, I dry-brushed white chalk paint over him, creating (hopefully) a sort of verdigris effect. I sealed the bird with some spray-on satin-finish polyurethane, and attached him to the board with small screws I had saved off some hinges. Here it is finished, resting on a small patio table. And here it is finished, resting on a box in the dining room. It’s kind of hard to get a good picture. I’m calling this look “Beachy Federalist,” because it looks like the perfect spot for George Washington to hang his swim trunks. 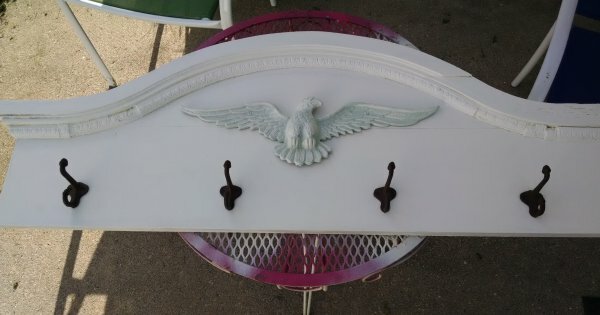 This entry was posted in DIY, Repurposing projects, Trash to Treasure. Bookmark the permalink.